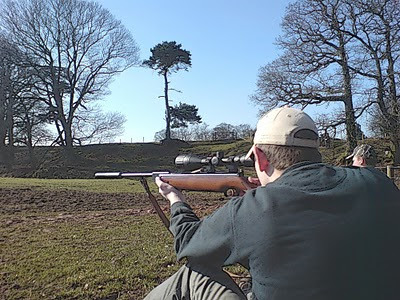 I spent another bright morning on Sunday at the Penkridge Air Rifle Club. There were several forty to fifty-yard shots that I particularly enjoyed since I've now got the beginnings of an idea about where the pellets from my - in effect - new .177 rifle will fall at this distance. It's very satisfying indeed to hear the pinging 'thwack!' as a tiny metal target fifty yards away flips back when your pellet goes home - a pleasure as well as a real confidence-builder. On the way home I spent a happy few minutes peering over a fence at an improbable trio of Ostriches in a nearby farm. As they stalked around the field I wondered just how far those sturdy legs would kick a fox foolish enough to try its luck with one of these stilt-walking giants. Cycling home, I startled a number of rabbits that had come out of the roadside hedges to take advantage of the suddenly spring-like afternoon sun and so, since I was to ride past the land where I have a permission, I decided to sit awhile behind the bars of a stile on the farm and see if I couldn't go home with the makings of a Sunday dinner. Fifteen minutes later a rabbit popped out of the fence-line and, newly confident in the accuracy of my rifle, I took the shot. Another very resounding thwack! rang out, but one rather startlingly close at hand. Looking up I realised that while my scope had an uninterrupted view over the crossbars of the stile to the rabbit, the barrel of the rifle had not shared in this privileged elevation: the pellet had buried itself half-an-inch deep in the wood and the noise had frightened the rabbit away. That sir, is pretty darn funny! That was one lucky bunny! ...whereupon the stile grew very still. Well, glad you had a fun Sunday before that, and that one more mistake you'll not repeat!